As an eye-catching, sloganeering, vote-winning policy, tuition-free public university is certainly a crowd pleaser. It was for Bernie Sanders, and his left-wing doppelganger in Britain, Jeremy Corbyn, is discovering the same thing. It’s the kind of policy that sounds big, bold, and revolutionary — especially to their young, usually middle-class college student supporters. However, as a way to provide a pathway to the middle class to America’s low-income families, it’s a dubious plan. Student debt is naturally a huge issue, particularly for the college-educated folks who typically dominate political discourse. Millennials are rightly nervous about the effects of high debt loads and stagnant wage growth. 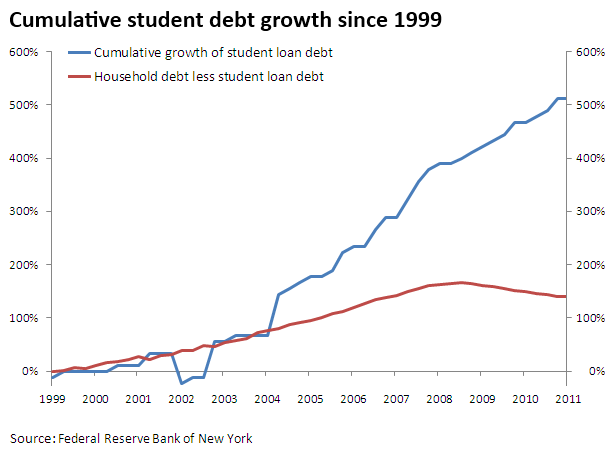 After all, student debt has become a much chunk of overall consumer debt. In fact, non-student household debt actually declined since the recession while student debt continued to climb. Partly, this explosion represents a positive trend: more folks are going to college and becoming more productive members of society, so more folks are investing in education. Debt need not lead to ruin: a student who starts at UC Berkeley right after high school and graduates in under five years can expect to have a fairly comfortable lifestyle after college. If she were an “average” student, she could expect a 6.9% yearly return on her investment in education after debt payments for the rest of her career — netting $732,000 in additional income against the $136,000 average in-state, on-campus costs. This is broadly true for most four-year university students who graduate on time. This is the picture for average students, but the number of qualifiers in the last sentence tells you where the problems lie: students who fail to graduate on time, don’t attend a four-year university, or otherwise fall through the cracks often struggle to repay their debts. Students who attend for-profit or community colleges (and fail to transfer) represented about 70% of student-debt-related defaults despite only holding about 11% of the overall amount of student debt and had found it much harder to improve their incomes than their peers who attended four-year colleges. Yet for hard-up borrowers, tuition is not nearly as large a burden as for their peers at four-year universities, who more often come from middle- and high-income backgrounds. 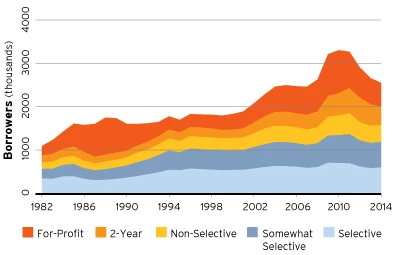 Although selective and somewhat selective four-years have seen modest increases in the number of borrowers, the bulk of the increase has been in non-selective, 2-year and for-profit colleges. Such colleges typically have much lower tuition than selective and somewhat selective colleges, and thus other expenses, like rent, books, food, even transportation, are more significant problems. The increasing burden on four-year schools reflects broader shifts in the economy. As the traditional middle-class job disappears and wages stagnate for folks without college degrees, more students from working-class feel the need to enter college to get ahead. Real incomes for male high school graduates have stagnated over the past half-century and a yawning gap in incomes has opened based on education. Significant wage gains are really only visible for those who go on to achieve at least a 4-year degree. In order to remain middle class, many families feel like stumping up the cash for their children to attend college is the only way forward. Thus, folks feel like they’re on an accelerating treadmill: running faster just to keep pace. Yet eliminating tuition would do nothing to help match low-income students with better colleges and probably not provide much in the way of financial relief. Tools for low-income students to pay for college already abound: most receive means-tested grants and scholarships, on average worth around 60% of tuition & fees from private universities, while Pell grants are a multi-billion dollar lifeline for poor families. As a result, high-income students effectively subsidize low-income students who get huge write-offs from the sticker price. Setting aside the massive costs to the state if the government assumed the full costs of all public four-year colleges, the distributional effect would be upwards: for every $1 a low-income family saves on tuition, a high-earner saves $1.24. Tuition and fees are a higher proportion of high-earners’ total expenditures, since low-earners get offered generous subsidies already by most private and public universities. Among education policy wonks, the data is so decisive that it’s practically an article of faith that eliminating tuition would benefit the middle- and high- earners far more than low-earners. 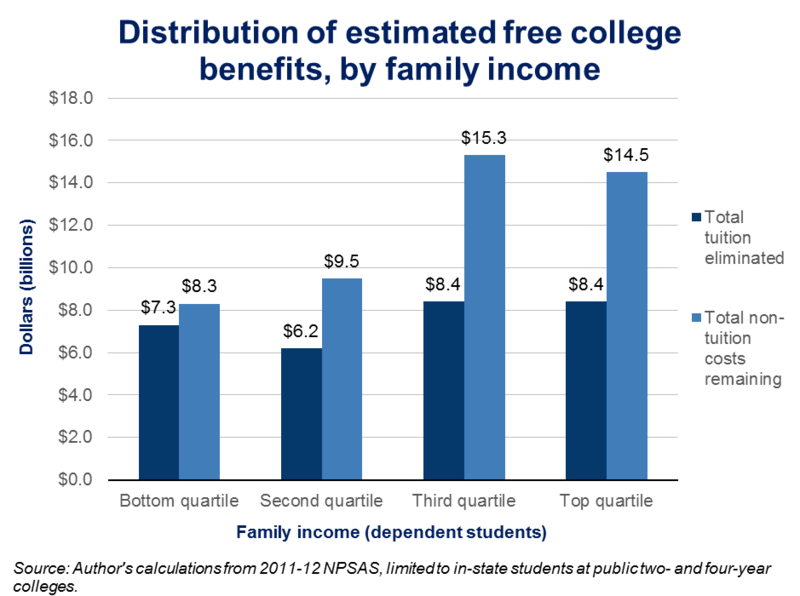 None of this is to say that students from low-income families don’t benefit, merely that targeting tuition delivers would entail a substantial hand-out to the rich and middle class with some spillover to low-income families. Whether or not this is good policy, then, is debatable — after all it’s not as though the middle class is sitting pretty and policies to help them get by certainly have social value. But free tuition most definitely is not a cornerstone of a fair, inclusive program of building ladders to economic success for low-income families. On the other hand, it’s certainly plausible that such a policy would be the best way politically to target education costs because such a policy would be supported by a far larger segment of voters than a policy that only targets the poor. Free tuition would take some pressure off middle- and low- income earners, but would unquestionably redistribute money towards the top, exacerbating already sky-high inequality. As a technocratic matter, there are alternatives that better-target low-income students and give them a pathway into the middle class through higher education. Smaller-scale solutions are actually better for the poor and working class. Families without a tradition of going to college have far more trouble navigating the admissions process — they often know only of the schools they hear of most — ones that pay for ads and receive press. They often lack access to alumni networks that can alert them to overlooked opportunities and institutions that can provide exactly what they need. In the absence of college advisors, these social networks are crucial for distributing information to help students apply to schools “suited” for them. The result is that up to 40% of high school graduates are “undermatched” in this way. Targeting for-profit colleges and universities like Obama did would help shut down institutions with high expenses and low outcomes that are responsible for the bulk of student defaults. Making college costs more transparent before applying and providing resources for college counselors in low-income neighborhoods would encourage more poor families to apply to colleges that can better serve students’ needs, further reducing the number who get “low quality” degrees and potentially increasing their access to financial aid. These ideas are not only more likely to pass GOP scrutiny than a massive government subsidy to the rich and middle class, they more accurately target the families that need government assistance. Incidentally, many in the GOP recognize the problem of mounting student debt and have proposed better-targeted policies than tuition-free college. Marco Rubio made some noise during the Republican presidential primary about his PAYE (Pay-as-you-earn) plan financed through the private sector, adapting the success of Britain’s higher education system. In principle, tying repayments to income paves the pathway to success for low-income families. This plan would cap yearly debt payments and tie them to earnings: if you make nothing you pay nothing. This arrangement exists in the US, but currently less than 15% of college debt payments are based on income. Introducing this nationally would build a ladder to the middle class and redistribute wealth down the income scale. Next ArticleFree Money for Everyone: The Future Policy of the Political Right?